Latda Village. 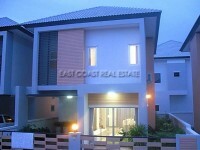 This simple cluster of homes is located off of Soi Chayapruek 2 in East Pattaya area. It is only 2 kilometres from Jomtien, and it has quick access onto Sukhumvit Road for travel throughout the Pattaya area. With a very spacious living room, dining room, this 2 bedroom, 2 bathroom villa also offers a great low cost property. The village is now managed by all of the co-owners who have decided that as each house is fully occupied that they do not need a security guard to simply sit at the entrance, so this keeps the monthly costs down for each home. The owner has taken very good care of the house and has always made significant upgrades and improvements to keep the house up to date. Details to the front of the house, water sprinklers in the garden, new air conditioners and a clean well decorated home is what you see here. Owned in Thai Name, the seller will split all taxes and transfers on a 50/50 basis with the new buyer.